It is exceptional with the modern style guest rooms under the concept of simplicity. Equipped with facilities and services, we will make your stay with us impressive and worthwhile. 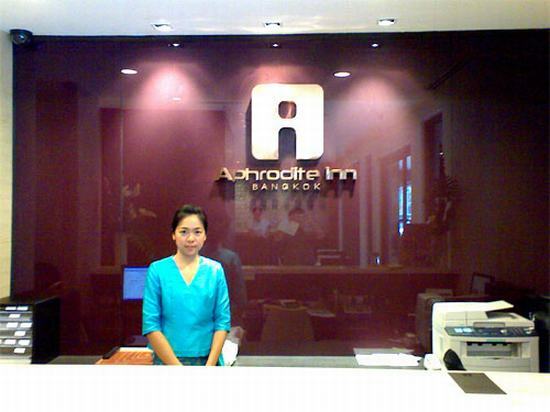 Aphrodite Inn is conveniently located in the heart of busting Bangkok. It is only a short distance to the central business district, embassies, and major tourist attractions. You save your time to get around the city by providing you with easy access to all kinds of transport. It takes only 5 minutes to the BTS Skytrain that take you to any major business centre. We are surrounded by a dozen of world class shopping and entertainment centres namely Central World Plaza. Big C departmentstore, Pratunam complex, Platinum plaza, Siam Centre, Narai phran exotic store and pratunam market. Four your secured stay, Aphrodite Inn gives you a full security system including closed-circuit television, keycard, safty box and security guards, giving you a complete relaxation without worries.